After laboring in Hollywood for close to a decade, Preston Sturges’ had had enough. Tired of watching his dialog either cut or changed to suit the taste of the director, he made an offer to Paramount Studio. He would sell them the script for The Great McGinty for $1, if they’d let him direct it. 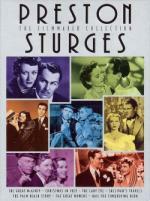 Paramount executives agreed and Sturges’ directorial debut would cement for him a level of independence over the next four years, that other seasoned film makers could only dream of. As the film opens we meet Dan McGinty (Brian Donlevy), an out of work drifter looking for his next meal. It is election night in the big city, and the main political machine is looking for anyone to pad their numbers. When McGinty is approached by a party boss about buying his vote for $2, he seizes upon the idea of voting multiple times across the city and padding himself with enough funds to last him awhile. When the polls close, he returns to the party boss with a ticket for each time he has voted for the party’s favorite son. When the party realizes that he voted 37 times, they usher him into the office of ‘The Boss’ (Akim Tamiroff), who wants to meet him. Sensing that he has a real go-getter and a possible political pushover, The Boss sets him up as an alderman, followed by Mayor and then finally Governor. Along the way, McGinty falls in love with his secretary, who slowly enlightens him about the graft and dishonesty that gave him his rise to power. He decides to right his wrongs, but this puts him in direct conflict with The Boss, who will stop at nothing to prevent him from exposing the corruption. Sounds like more of a screenplay for a gangster picture of the time than a comedy. But in the hands of Sturges, the film skewers the many foibles of the political process, with the comical sparring of McGinty and the Boss in center ring. You can’t help but cheer for McGinty as he slowly takes down his crafty puppet-master, all the while feeling for the Boss, as his world slowly topples around him. A first rate foray for Sturges.